Your love is truly unique, so remind her with our Valentine’s surprise that’s like no other. 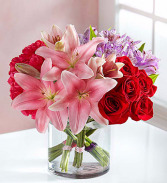 Four hand tied bouquets are gathered close together inside a sleek glass vase to capture the special bond you share in colorful and contemporary style. 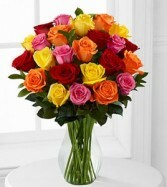 The Sunny Sentiments™ Bouquet has a warm, welcoming look that will win over your special recipient with each sunlit bloom. 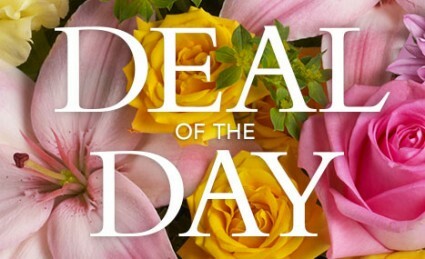 Yellow roses and Peruvian Lilies are set to brighten their day, arranged amongst bright white traditional daisies, green button poms, and lush greens to create a stunning presentation. 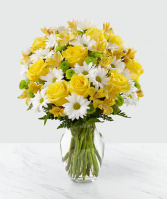 Arriving arranged to perfection in a clear glass vase, this fresh flower bouquet is ready to help you send your sweetest thank you, thinking of you, or get well wishes.